You Can Drink Without Cooking ! 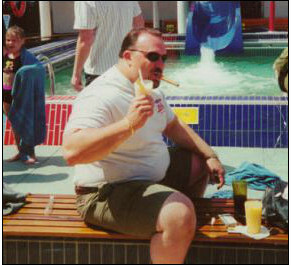 Chris LaCascia lost 130 lbs of bodyfat in only 9 months using Egg Whites International for 3 of his 6 daily meals! HoHoHo = $50 Off 8 Gallon Case! HoHoHo = $29 Off 4 Gallon Case! HoHoHo = $29 Off Pro Starter Pack! HoHoHo = $29 Off Pro Pack! HoHoHo = $29 Off Variety Starter Pack! HoHoHo = $24 Off 6 Half Gallon Case! HoHoHo = $20 Off Starter Pack! HoHoHo = $20 Off 2 Gallon order! QUESTION: What's the best Muscle Building/Fat Burning thing you can put into your body? Don't believe it? Try eating ONLY supplements and see what happens! High Quality REAL FOOD "PROTEIN" is required to Build Muscle or Lose Fat and Egg White PROTEIN is the Best. 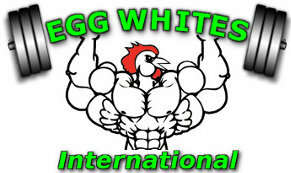 Egg Whites International PROTEIN is even better because these are LIQUID Egg Whites that do not need to be cooked. They mix easily into all your favorite Juices, Shakes, or Drinks without cooking! 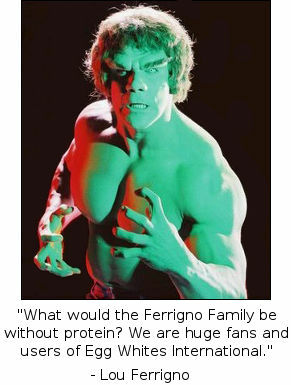 What do HERCULES and THE HULK have in Common? You can't completely digest a raw egg and if you drink them like "Rocky" you might get Salmonella Poisoning. In addition, Avidin, an enzyme found in raw eggs, may inhibit Biotin uptake. That's why Pure Liquid Egg White PROTEIN by Egg Whites International is PASTEURIZED to kill Salmonella and neutralize Avidin. Pure Liquid Egg White PROTEIN is “Liquid”, NOT Raw, and completely safe! They are Odorless, Tasteless, and Mix Easily into all your shakes, drinks, or foods without cooking and the Protein is 100% Bio-Available. 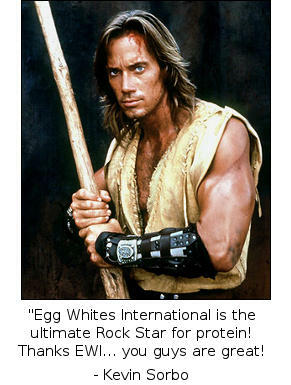 Egg Whites International PROTEIN is 100% Bio-Available up to 5 hours. Protein Powders are only 80% usable up to 3 hours. EWI gives you MORE PROTEIN for 2 more hours! Want to save $ on Whey Protein Powders? Just use 1/2 serving and mix with 8 oz of Liquid Egg Whites! 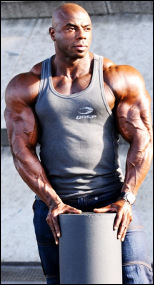 "As a professional Bodybuilder, Egg Whites are essential to my diet and preparation." "Thanks Egg Whites International for the Best Darn Egg Whites Ever!" "I am using Egg Whites International in all my shakes (morning , noon, evening)"
"In the first 30 days I lost 3 lbs of fat and gained 5 lbs of lean body mass!" "So easy to mix in oats or protein shakes for some extra pure protein!"